The Chinese authorities have arrested seven Tibetan monks from the Tsenden monastery in the prefecture of Nagchu and have held them incommunicado on unspecified charges since 14 March 2015. The monks were allegedly arrested for activities that challenge the Chinese control of the region. The source said the authorities have installed security cameras to monitor the monks within the monastery and, since the beginning of March, have clamped down on the use of social media throughout the region. Chinese authorities have arrested seven Tibetan monks on unspecified charges and are holding them incommunicado in a restive county in the Tibet Autonomous Region, according to a source in exile, who said police had clamped down on their monastery in the wake of the detentions. The seven from Tsenden monastery in Sog (in Chinese, Suo) county in Nagchu (Naqu) prefecture were arrested March 14, Ngawang Tharpa, a Tibetan living in Dharamsala, India told RFA’s Tibetan Service. “The arrested monks are Namgyal Tsultrim, Lodoe Tenzin, Tsultrim Gongji, Tsultrim Namgyal, Thabkey Lhundup, Jigme Tsultrim, and Jigme Drakpa,” Tharpa said. “The monks have been held incommunicado since then and the police did not give any explanation for their arrest,” he said. According to Tharpa, Namgyal Tsultrim had been held by authorities for seven days in 2011 “on suspicion of maintaining contacts outside” of the region, though he did not provide the dates of his detention. “He was arrested again on Oct. 6, 2012 and held at the Nagchu detention center for five months and then at the Tuelung prison for another three months,” he added. It was unclear what Namgyal Tsultrim had been charged with in 2012 and whether he had been tried before his transfer to the prison. Tharpa did not specify whether any of the other six monks had previously been detained. Meanwhile, he said, Chinese authorities had installed around 50 security cameras to monitor the monks of Tsenden monastery, amid a heavy police presence there. 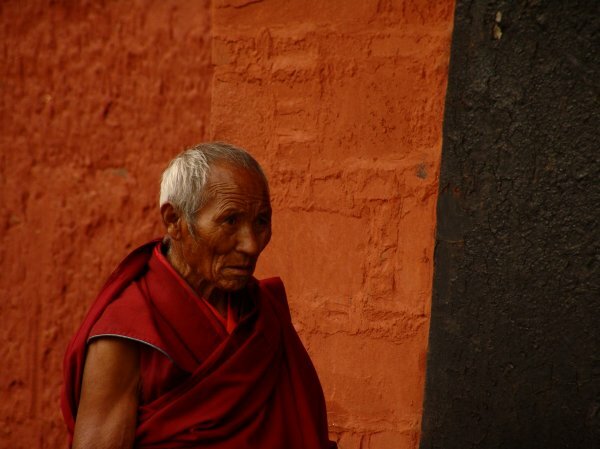 “The monks are watched closely around the clock, and they live in a constant state of fear and intimidation. They even complain of police harassment at night when they go out to use the bathroom,” he said. Tharpa quoted sources in the region as saying authorities had clamped down on the use of social networking sites and other social media platforms throughout Tibet since the beginning of March, and particularly in the three Nagchu counties of Drachen (Baqing), Driru (Biru) and Sog. Similarly, any Tibetans with a previous record of political activism have been called in for interrogation by local authorities in recent weeks, he said. In January, sources told RFA that a Tibetan monk was ordered jailed for 10 years by a Chinese court in Tibet almost a year after being detained on still-unspecified charges. He had been detained in Sog county on unknown charges on March 17, 2014, along with three other monks from Drilda monastery following a roundup earlier that month of at least nine other area residents suspected of painting independence slogans on boulders near an iron bridge in Trido township.